What do you think after hearing the word “volcano”? Volcanoes sometimes really make us afraid when active. Because when it’s raging, volcanoes will cause great harm and suffering to all creatures in the area. However, it cannot be denied if the volcano also has its own beauty. Countries that have beautiful volcanoes, often get economic benefits from local and foreign tourists who visit the volcano. One country with a phenomenal volcano is Russia. Russia is a country that has winter, but in this country there is also a stratovolcano located in the eastern part of the Kamchatka Peninsula, Russia. This is a stratovolcano compound located in the 10 km caldera in 15 x 20 km mid-Pleistocene Stena-Soboliny caldera. It is Maly Semyachik Volcano. Maly Semyachik Volcano has a historically active crater lake called Troitsky, which was formed during the large explosive eruption of Ceno-Semiachik some 400 years ago. So far, Russia is famous for its unique natural attractions such as Putorana Plateau, Curonian Spit, and Lena Pillars. However, besides that, Maly Semyachik Volcano also has a beauty that is no less interesting. Especially for those of you who like hiking, you must be very interested in the beauty of Maly Semyachik Volcano. We have provided 7 facts that you should know about Maly Semyachik Volcano specifically for you. these facts will definitely make you fall in love with Russia’s natural purity. The Maly Semyachik Volcano is short volcanic about 3 km long. has 3 cones, namely, the ancient north cone with a height of 1560 meters, a central cone with a half-closed crater, and a south-west cone with several craters (including the active Troitsky crater). This combination of 3 cones and their beauty will stop you from saying WOW when you see it. Troitsky Crater is named after members of many Kamchatka expeditions, VD Troitsky, which explored the Maly Semyachik volcano. They found the very beautiful Troitsky crater. Troitsky Crater is an deep oval funnel with a depth of 700 meters with a lake at the bottom. The steep 200 meter wall is composed of interlocking lava and tuff layers, which make a striped wall. Sediment fumaroles add white, yellow, and greenness which makes this crater even more enchanting. The most prominent part of this crater is the green-green lake. This color is caused by sulfur from an underwater fumarole. Lake temperatures range from 30 ° C to 40 ° C. The lake diameter is around 500 to 600 meters, the area is more than 200,000 square meters, and the depth is around 117 to 140 meters. Water mineralization in the Troitsky crater lake reaches 40-50 grams per liter, which is significantly higher than the salt content in seawater. This is what causes the lake water to have a strong sour taste. Troitsky crater is still active today. Locals saw the last smoke from the volcano in 1946. The lake has expanded to around 8 to 10%. Maly Semyachik is a natural monument. The origin of the word “Semyachik” comes from the Russian native language “Shemech” which means “stone land” or “mountainous land”. Maly Semyachik Volcano is the only volcano that is still active in the Eastern Range of Kamchatk. This volcano erupted in 1804 which claimed the death of a large forest so that a large area of ​​forest was covered in gravel and sand. What a terrible eruption. In 1945-1946 there was also the release of strong gas and black clouds were seen at low altitude above the crater. As a result of strong emissions, the crater lake area increased by 8-10%. The area around Maly Semyachik Volcano is very impressive. On one side there are deserts, fields of dry ash, formless piles which are the remnants of lava, and rare alder gardens. On the other hand, there are high water flows, very fertile shrubs and birch gardens and large plants. In this area, there is a phenomenon called gigantism. Herbs of cereals have a length to the waist and hogweed can grow 2-3 meters. Two sides that really contrast. One side of the barren area, and one side of the area is fertile. Very unique right? Kamchadals believe volcanoes are the place where the dead live and say that when it’s hot, their spirits can be seen as smoke above the top. According to the natives, they eat and hunt whales in the underground sea. Not only kamchadals, but the Cossacks also regard volcanoes as “ignition”, a sign of bloodshed. The longer and stronger the mountain burns, the more blood will be shed. The Kamchadals acknowledge the mountain god “Kamuli” (in Kamchadal “Kamulech” which means “small soul”). This mountain god, according to the natives, is a human enemy. They live in the highest volcano, smoke and breathe fire. The tour is arranged to the Maly Semyachik volcano. Including environmental travel. If the weather allows, the guide will guide the tourists to go down to the Troitsky crater lake. 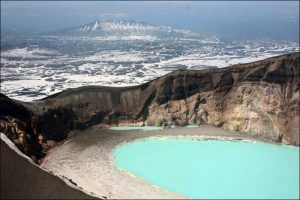 Many Kamchatka travel agents also offer tour tours with helicopters so you can enjoy the natural beauty of Maly Semyachik and the greenish Troitsky crater lake. Maly Semyachik Volcano truly presents pristine natural beauty and civilization of the surrounding community. For those of you who like adventure on a volcano with a beautiful crater, then Maly Semyachik Volcano is a very right choice. And a tour to this place is also very easy, because you will be guided by a tour guide as we explained. And you should take a vacation to this place when the weather allows, so you can clearly see the charm of the Troitsky crater lake. That’s 7 facts you should know about Maly Semyachik Volcano that we have presented specifically for you, Russian nature lovers. Hopefully our article this time can help you find unique tourist attractions that you should visit immediately. Enjoy it!